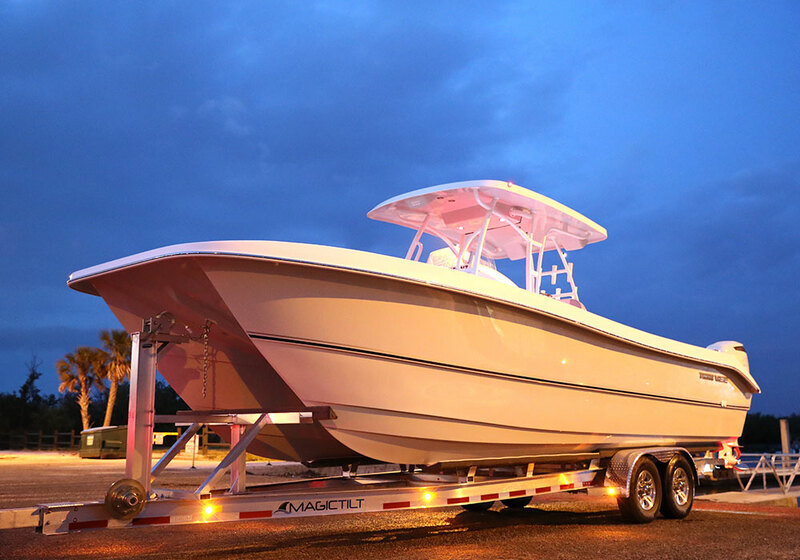 The 310 GF PowerCat is the most versatile offshore, deep sea fishing platform available on the market today. Powered by two 300HP motors, the 310 GF PowerCat offers an unparalleled stable ride. Boasting an expansive interior complete with bench seating, the 310 GF PowerCat contains larger deck space compared to boats of equal length, thanks to its nine-foot, six-inch beam. The center console has a fully upholstered Coffin Box that doubles as a sun pad and back rest. Avid fishers will also enjoy the 50-gallon live well, a 300-quart fish box, storage area, a six-gallon fresh water wash down tank, over thirty rod holders, and 360-degree fishability around the boat. INCLUDING TWIN SUZUKI 300APX MOTORS, INSTALLATION, CONTROLS, HARNESSES, FUEL GAUGE, TACHOMETER, SUZUKI/RACOR FUEL FILTERS, AND STAINLESS STEEL PROPS.